As part of the 2016-2020 Strategic Plan, the University of Sydney will undergo an aesthetic transformation. Coming soon to our beloved campus is a series of public art projects, commissioned with the intention of creating an innovative and artistic legacy at USyd. Under a new ‘Art in Public Space Strategy’, ten artworks are planned, all by Aboriginal and Torres Strait Islander artists. By having Aboriginal art as the aesthetic and ideological backbone of forthcoming public art projects, the University is hoping to better connect with the Redfern Aboriginal community as well as Aboriginal and Torres Strait Islander communities Australia-wide. The first two artworks have already taken shape on campus. Artist Robert Andrew sees university as a meeting point—a physical and metaphorical place for sharing and deepening knowledge. Andrew, a descendant of the Yawuru people of the Broome area in the Kimberley, Western Australia, consulted with local communities in the design of his work. The visual basis of his work is the word ‘Garabara’ from Eora language, meaning “dance, a method of dancing”. Andrew searched for a term which conveyed that over time and across cultures, this site—in this instance, the university—has been used to embed and transfer knowledge. Dancing, he writes “is used in ceremony, for storytelling and the passing of knowledge and knowledge systems to the initiated, the uninitiated and to other groups/clans from different geographical areas”. Andrew believes, like all complex knowledge systems, the world is not instantaneously understandable on first glance. Differing perspectives reveal different outcomes. 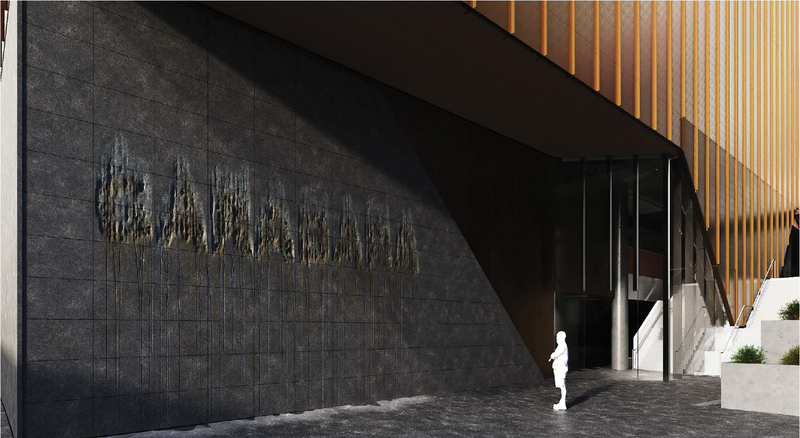 By etching, milling, painting and inlaying, the word ‘Garabara’ becomes sculptural, its form and boundaries reflected by natural processes of change such as erosion and leaching. The final result: an embodiment of how old and new knowledge systems overlap, interact, and change with one another. CNC routing of granite panels creates an erosion pattern. Andrew modelled the erosion patterns of the work from sandstone erosion along the Bondi coastline. Embedded organic bronze and mild steel have been inserted in the granite to create areas of eroded text. The image above shows “GARABARA”—but legibility will change according to levels of lighting. Beneath, on the ground, pavers have polished or honed surfaces, clear coated to create a reflective surface reminiscent of actual water on the floor. This imagery reflects the coastline sandstone which inspired the work, but also continues (perhaps intentionally) the design of Eastern Avenue, where pavers, when wet, are designed to create a mirrorlike finish reflecting the sandstone buildings. Dale Harding plans to interconnect three different public artworks at the City Road end of Eastern Avenue through aesthetics and content. 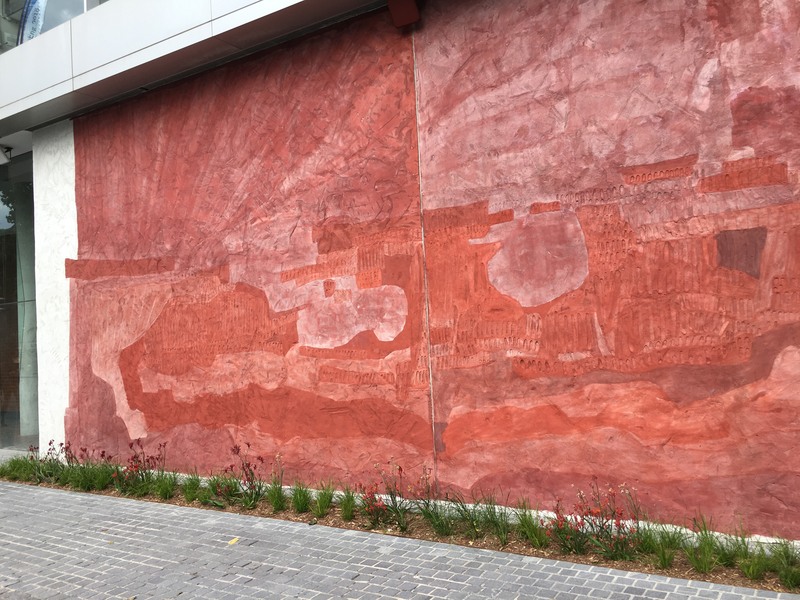 Harding, a descendent of the Bidjara, Ghungalu and Garingbal peoples of Central Queensland, identified three different locations for connected artworks: 1. a monumental sculpture outside the Madsen building, 2. a wall painting in the LEES building, and 3. a wall painting inspired by rock art on the blue wall. The pieces act as a homage to the rock art of Harding’s ancestors—the sandstone of their country connecting to Sydney via the Great Dividing Range. 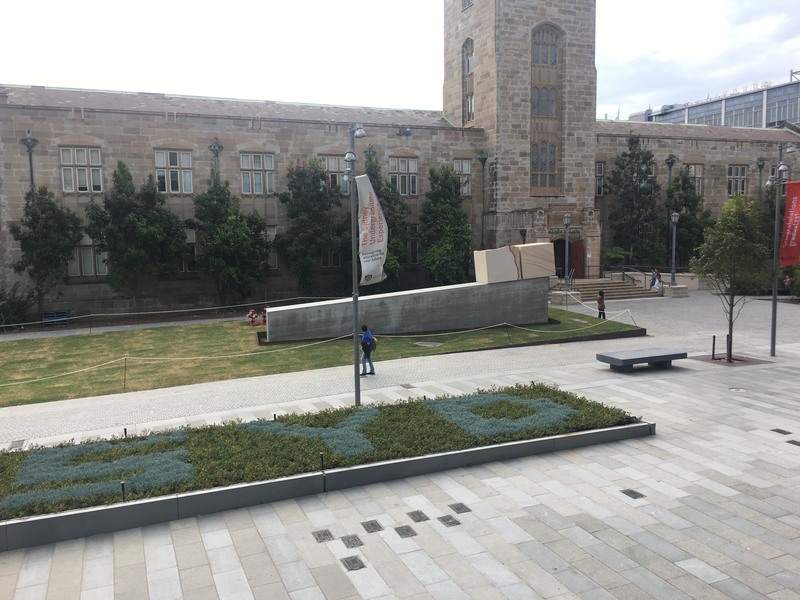 By bringing this art to the university, Harding aims to fill in the gap between USyd and their culture and landscape.